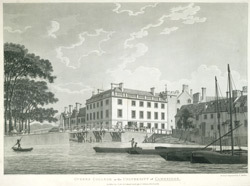 Artist and engraver: Malton, T.
View of the River Front of Queens' College, Cambridge. This corner building was built by James Essex in 1756-60. He had originally intended an entire range, but the college could not afford it and in the end only this part was built. Even then it was financially disastrous for the college. Part of the 15th century riverfront buildings remain intact. Also seen in this picture are several cottages and a bridge leading to an old granary. There were several mills nearby, and these moored barges may be connected with the mills.